Some of you may recall that a month ago, I was having problems syncing with OneNote and SkyDrive. Despite hours of checking through the various libraries and layers of software that might have been broken, I didn’t seem to get anywhere. That said, there’s another odd problem I’ve observed over the past month where Outlook would pop up a “MailTips could not be retrieved” message whenever I composed email. 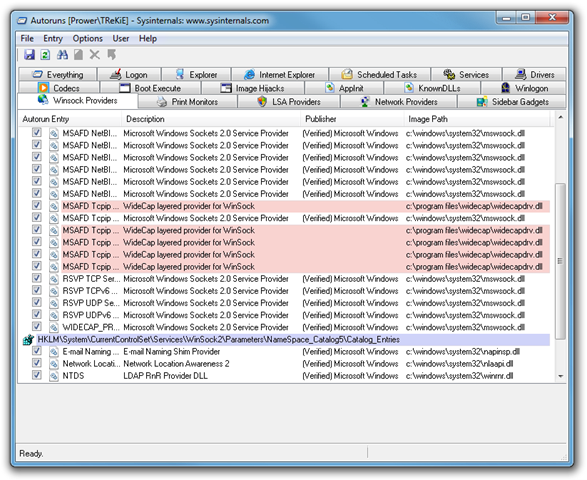 As I’m the only person on my Exchange server and so the feature didn’t do anything for me, I just assumed Exchange 2010 SP2 had broken something (also released and installed at the beginning of December). But it showed up today and I figured I would deal with it. I’m no stranger to these problems as previous Exchange/Outlook versions were far less forgiving, so my first step was to check if it could actually get to Exchange Web Services and the offline address book on my domain. I popped in the URLs in IE and they worked. 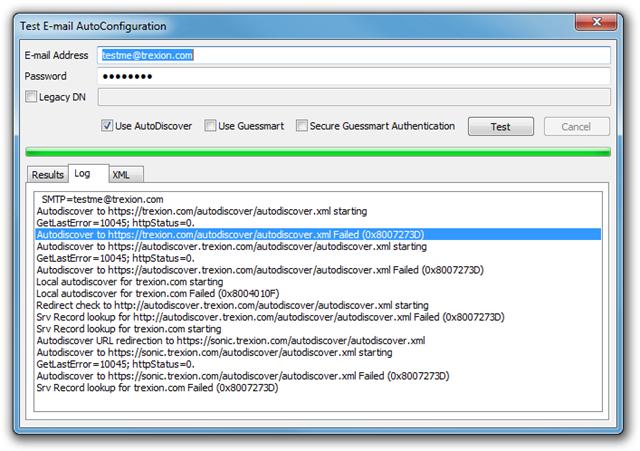 Then I moved on to the Autodiscover configuration. Again, putting the URL in IE, punching in my credentials, resulted in everything checking out. Thankfully Outlook has its own Autodiscover test feature, which outputted an error of 0x8007273D or The attempted operation is not supported for the type of object referenced. This rang the alarm bells in my head immediately. This was just another version of the weird “sorry, I can’t do that Jonathan” message. A search only found one post talking about this error code with Autodiscover and no real solution. So although connectivity was fine in the browser, there was some connectivity or protocol problem between these few applications and the outside network. Unfortunately debugging the traffic itself is near to impossible in this case, since both programs are closed source and one can’t just load up Wireshark to poke into HTTPS traffic. But I had a hunch that I wouldn’t need to go through all that, instead I loaded up the incredibly useful Windows SysInternals autoruns tool and starting going through the network related tabs. And sure enough, conveniently highlighted in red (due to no digital certificate) was my problem – WideCap. Although I’ve been using “sockscap”-like software to proxy or tunnel my connection (when needed) for quite some time, I had only seen WideCap referenced somewhere very recently and tried it out… and forgotten about it. So, heading over to the Programs applet, the final piece fell into place. …installed on December 4th. Just a week before I noticed the OneNote problem. So I uninstalled it, rebooted the system and loaded up OneNote. The web sync now magically worked. I started Outlook, did the Autodiscover test and it succeeded. MailTips were once again working in a new email reply. All was working again. In my original post you may have noted that there was a thread with several people with the same problem. Although I’m not at all suggesting they’ve all installed WideCap, but I do suspect they’ve installed some other software which has lovingly inserted a winsock provider or something similar into their installation. Back on the Messenger newsgroups, the top issue was signing into the Messenger service and if IE was working, thus proving the SSL parts of Windows were functioning, the problem usually was third-party software (almost always “internet security” related applications). In fact since Messenger was unaffected by this problem and it’s usually the first to break, it didn’t occur to me to check for this possibility a month ago. So, another case is closed, my cloud is happy again and I’m pleased. Posted on January 8, 2012, in Uncategorized. Bookmark the permalink. 4 Comments. I just spent the day working out why Microsoft Update hung when invoked and why Microsoft Security Essentials hung when trying to update virus signature files. Yup, uninstalling widecap 1.5 solved both problems. Wish I had seen your article before reinventing this wheel. The software named “Google Web Accelerator” is an example of software that will make SkyDrive app stop it’s work (….not possible to login, “logging in forever” ….). Do u have Google Web accellerator installed on your computer, …just deinstall it and all will be fine with SkyDrive sync.